A few weeks ago on a gloriously sunny and warm day in November, we headed down to Jeffersonville, Indiana for a fun day trip. It's just across the Ohio River from Louisville. (I posted one of my favorite photos from our trip here already.) I'm excited to share more about that day with you in the weeks to come. When we visited, they were making the most adorable, itty bitty Christmas candies in the front window of the shop. I can't imagine making something so delicate. Learning to knit will forever be my hands' only accomplishment. Another delightful aspect of the shop is all the memorabilia they've held onto. My husband spotted this old-fashioned candy vending machine. 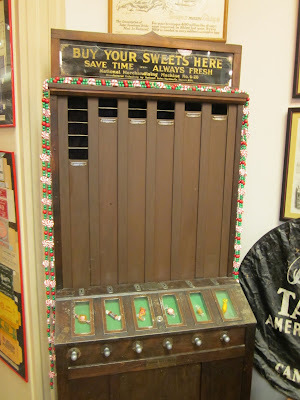 It's hard to believe, in the age of king-sized Snickers bars, that machines used to dispense tiny peppermints or caramels. Schimpff's is known for their red-hot candies, which they still make on antique equipment. 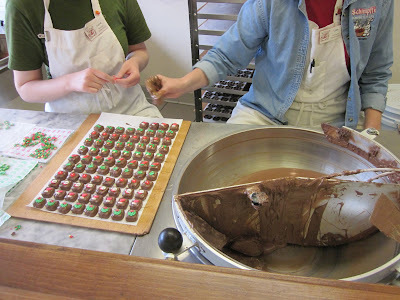 But I've never been one to be able to walk by chocolate and pass it up. So we purchased a few of their turtle candies and were not disappointed. Half of the building is the candy shop, soda fountain and small restaurant. 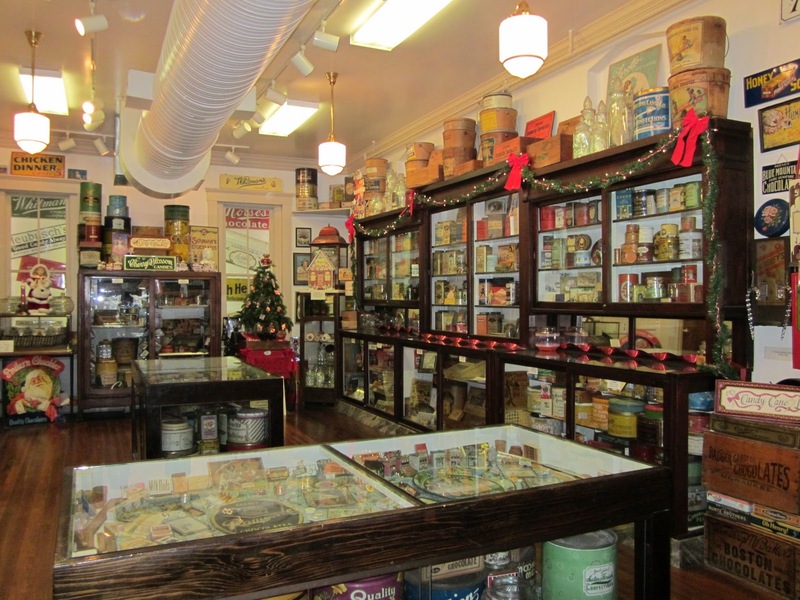 The other half is a museum (pictured above), dedicated to the history of the business. 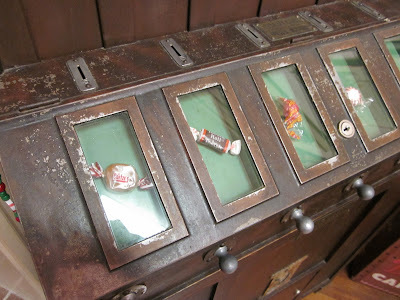 Candy is made in the window fronts and on the museum side. If you visit and have older kids with longer attention spans, I highly recommend calling ahead and scheduling a tour. We got to listen to bits and pieces of a tour taking place while we were there, and the history of this place is fascinating. This post is a part of Wanderfood Wednesday and Wanderlust and Lipstick. Looks like a dreamy place to visit. what an incredible place - i'd love to visit!